Super organized entrepreneurs review their goals every day. The entrepreneur’s goals are guiding lights. Every successful entrepreneur has goals, and the most successful entrepreneurs review their goals frequently. Keeping your goals front and center allows you to weave through the chaos. It’s an introspective process that helps you hack at extraneous details. It can reveal what is important, what is a waste of time and what you should do about it all. To instantly bring organization and clarity to your life, review your goals often. Super organized entrepreneurs batch tasks. “Batching” is collecting all of your similar tasks for the day (or week) and doing them all at once. Email: Sit down and do it all at once. Writing articles: Get it done in a single morning. Writing your business plan: Take an afternoon and write it down. They work on the one thing that will move their business forward. For most entrepreneurs, there’s that one thing in your mind that you know you should do. You recognize its importance and even realize that it has the potential to change your business and dramatically move things forward. The problem? You feel too disorganized to do it. A simple way to usher organization into your life is to just do it. Every day when you wake up, resolve to do at least one task that will move your business forward. Doing so will organize your thinking and your priorities. It will give you a clear and coherent vision for the success of your business. 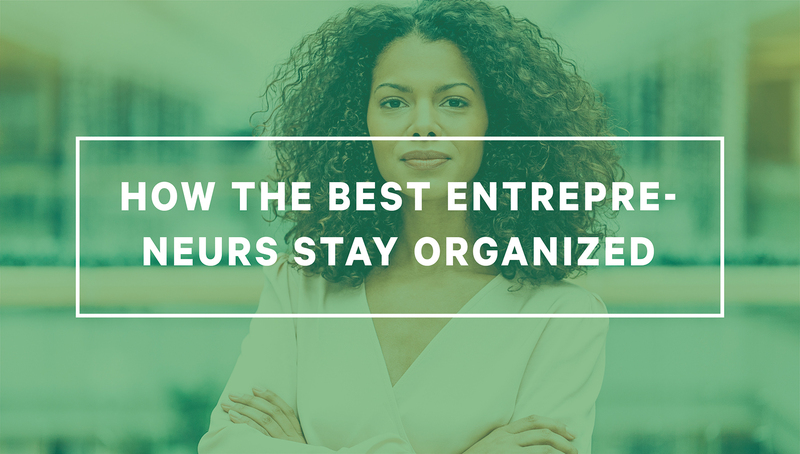 Super organized entrepreneurs choose a few major tasks for the day. Staying organized is as much about what you choose not to do as it is about what you choose to do. Choosing too many “priorities” for the day will crush you and leave you gasping for relief. Before you know it, your day will crumble into a pile of disorganized chaos. The secret to staying on track? Select a few things that you need to get done for the day. Maybe it’s a single task — an article, a marketing plan, one step in a new hire, etc., — that you must get done. Unfortunately, “These Big Rocks get pushed back from week to week because we never have time to do them — our days fill up too quickly. Too often we overstep the Big Rocks only to look back nostalgically. How do you avoid this problem? By planning your week with the Big Rocks first. For the entrepreneur, it’s delegate or die. In fact, the art of delegation may be the difference between entrepreneurs who flounder and entrepreneurs who succeed. BBC reports that “delegating gets harder to do the higher someone goes up the corporate ladder.” For the entrepreneur delegation can be even more difficult. The Harvard business review provides a helpful process to move from anti-delegator to master delegator. Understand why you’re not delegating. Integrate delegation into what you already do..Ask others to hold you accountable. Here are some of the things that entrepreneurs must learn to delegate. Anything you don’t enjoy doing. Anything you don’t do well. Anything that will help to increase cash flow. Anything that is getting in the way of growing your business. Anything that is process-oriented (easy to do) but time consuming. Anything you want a team member or aspiring leader to learn to do. If you run all your tasks through this delegation matrix, you may discover you’re left with very little to do. What does this mean? Have you delegated too much? No indeed. Instead you’ve unlocked the secret of master entrepreneurship. You’ve freed yourself of administrative minutiae and can take your business to extraordinary new heights.